No more unpacking your luggage one article at a time. Now with one bag, you can do it all at once, and still remain completely organized. Simply fill its shelves with your neatly folded clothes, and simply drop it into your suitcase. You can use the compression straps to further tighten the Jetpack so items dont move around during your travels. Once you have arrived at your destination, simply release the compression straps, and hang the JetPack in your closet - and your done ! Now, you'll be able to quickly and easily see all of your clothes with the help of a 360 degree swivel hook you can also access the multitude of pockets all along the backside of the JetPack as well. When it's time to pack up and head home, it's as simple as dropping the JetPack back into your luggage. The Jetpack is incredibly strong, and can hold up to 70 lbs when hanging, but yet still being very lightweight, weighing in at only 2 lbs ! The JetPack is the perfect companion for any traveler. 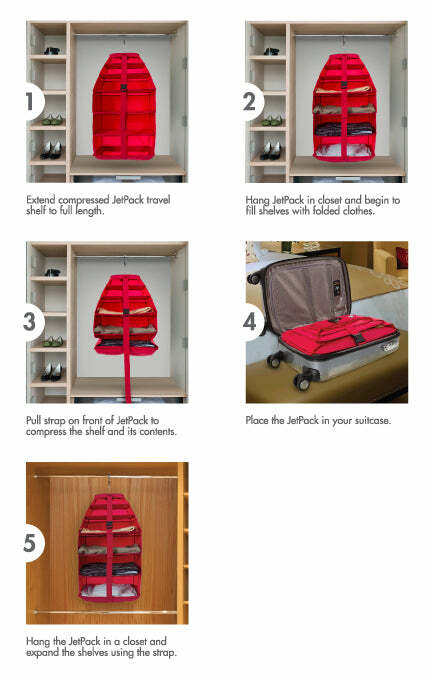 This ingenious and lightweight travel solution will make packing more organized, more efficient and stress-free.